This video reveals the problems Pakistani workers are facing in Saudi Arabia, they are explaining there Iqama (work permits) are still valid but they are arrested and their sponsors are asking for extra money to cooperate them or get them released from Detention. In recent times Saudi Arabian govt is doing much improvement in Labor system and laws. I hope the problems of these Pakistani workers will end soon. It is a humble request from Pakistani community to Saudi Arabian authorities to sort out problems of these helpless workers. This video has gone viral on social media, it is uploaded on facebook and other social sites by various people. Take a look at the video below, the labor explaining his problems in Urdu. Freshi Ice Sticks is a Jeddah based Ice Cream / Ice Sticks manufacturer and retailer who sells fruit based Italian ice cream called gelato. Freshi is rapidly moving across Jeddah as it has 13 retail branches in some of Jeddah’s most visited shopping malls in short period of time. Their products are liked by all age groups, children, youth and senior citizens because they use fruit based ice cream which is categorized best ice cream available these days. One of another great feature of their ice cream is less use of butter-fat and sugar, Freshi claims they are using 50% less sugar than other ice cream brands available in local market. Why I am telling you about Freshi Ice Sticks might be something very exciting for all of you specially Jeddah Photographers and that is a Photography Contest Freshi Ice Sticks has started recently. This contest aims more and more people visiting Freshi Ice Sticks branches and become aware of their product as well as take photos and become eligible to win an iPad Air. Freshi Ice Sticks requires photographers to take photos of children or adults holding their products e.g Ice Stick. There are other prizes as well, top 10 photographs will win prizes,50 Ice Sticks treat for 2nd position holder and 25 Ice Sticks treat for 3rd best photo, while 4th to 10th positions will get 10 Ice Sticks each. 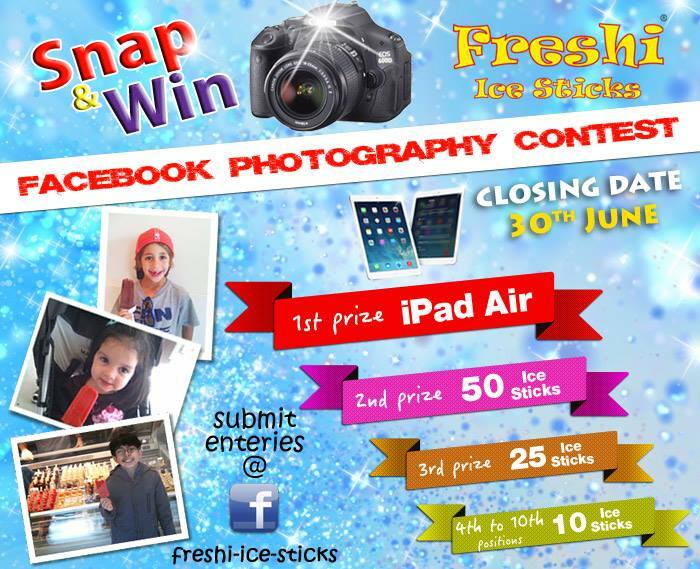 It is time for you to show your photography skills and take a best shot of Freshi Ice Sticks with a person, then submit your photo to Freshi Ice Sticks fan page on the facebook. Below are some Terms and Conditions or procedure of participating in this photography contest.